Jan (2 weeks ago) Inappropriate? Explanoite (3 years ago) Inappropriate? Speculativism (3 years ago) Inappropriate? Thank you for all your clever work. Nice Nice Nice! Thank you. tasa78 (7 years ago) Inappropriate? meatbag35 (9 years ago) Inappropriate? This is a beautiful piece, thanks for sharing! Thank you so much for this contribution. segiva (9 years ago) Inappropriate? templarlover (9 years ago) Inappropriate? This is simply gorgeous! Thank you. I don't know how I missed this one either! This is awesome. If sharecg had a 5 star system, I would give this a 10! Thank you ladies, you made my day. I don't know how I missed this one either! This is awesome. If sharecg had a 5 star system, I would give this a 10! MagicDreamFire (10 years ago) Inappropriate? I have no idea how I missed this one, but it is so perfect. Wayii (10 years ago) Inappropriate? Dark, honey, I'm not Cho. It's flattering that you'd mistake me for her, but nope, I'm Wayii/Azhrarn. Thank you for the compliments though. simply lovely! cho I hope all things work out for you and your site!!!! those corporate scumbags need to tortured tremedeously!!! good luck hun!!! you are waaaaaaaaaaaaay too nice for this type of thing to happen to you!!!! Goldenthrush (10 years ago) Inappropriate? Beautiful. Thank you for sharing with us. SilentKnight (10 years ago) Inappropriate? What a wonderful gift! Thanks, ladies! Beautiful! Thank you ladies - the robe looks absolutely gorgeous! ThespiSis (10 years ago) Inappropriate? Many thanks for this wonderful robe!!!! :D It really is a gorgeous dress. 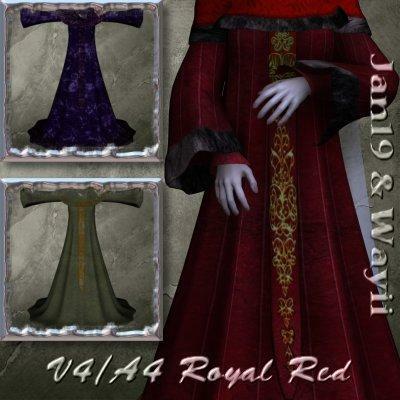 Jan did a brilliant job with her UV Mapping, which made it a lot easier to get the textures done. I plan on doing a few sets for this one. I can't wait to see what people do with it. Arkathan (10 years ago) Inappropriate? Snagged. Thanks to both of you!